Knowing when a child needs therapy can be far from clear: not all are good at communicating distress. Maarit Rivers explains how and why. 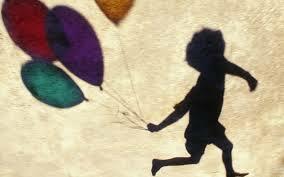 Shadow of a child with balloon, pic original source unknown. Life can be challenging not just for adults, but for children too. Some children need specialised help to cope with problematic feelings.Parents may assume children ‘grow out of’ whatever is troubling them. Some do, but not all – depending on their personality and resilience. Problems occur when the child has no adequate way of communicating its distress. As few can do this in words such issues may lead to aggression, violence, depression and personality disorders. Is your child bullied or bullies? Does your child have mood swings such as being joyful one minute, tearful the next? Has he lost the interest of previously enjoyed activities? Has she become sulky, angry, aggressive, or is anxious and withdrawn? Does your child seem depressed, sad or tearful? Has your child developed insomnia, becoming overly sleepy, having nightmares or is bed-wetting? Is she reluctant (or refuses) to go to school? Is her school performance dropping or becoming sloppy, or she outright refuses to do it. Have you noticed a lack of, or sudden change of appetite, or complaints such as not feeling well, bellyaches or headaches, particularly when the doctor confirms there is nothing physically wrong? Your child will also benefit from professional therapy if there is evidence of developmental delays, autism, learning or attention deficit problem (ADHD). Children are likely to need professional help to cope with life changing events such as separation or divorce, a death in a family and when a loved pet dies. Moving to a different home can be especially stressful for some children. When your child or a family member is seriously or chronically ill, and when you or your child has had a traumatic event – Maarit Rivers has multiple qualifications and years of experience to truly assist. Make an appointment now.